An amazing video showing community support of World Down Syndrome Day by Kelly Ryser. Mobile viewers click here. He doesn’t wear a cape. He hasn’t rescued any damsels in distress — but Andrew Banar is a hero. And fittingly, the 20-year-old entrepreneur officially earned that designation on World Down Syndrome Day, Wednesday, March 21. But he doesn’t see himself as a hero. “I just try to do nice things,” he said. While the Cardinal Carter student was born with Down Syndrome, he has not let it hold him back. In fact, he has probably accomplished more than many of his peers. Like starting his own business. Or maybe donating more than $8,000 to local charities. Or even making plans for a post-secondary education. And that is where his dream began. For Andrew the dream of going to college motivated him to look beyond any limits that may have been placed on him. And with the help of an extremely supportive mom, Karen Pickle, Andrew was able to combine his artistic talent with his love of drumming which led to Group Hug Apparel. His apparel company, which features his own designs and the catch phrase ‘Rock On’, has earned thousands of dollars in just two years in business — probably enough to pay for Andrew’s college education. But in a selfless decision, Andrew decided to share his earnings with more than 10 different local charities. And help them he has. He spends virtually every weekend at community events — hocking his wares and mingling with members of the community. Andrew has become a familiar face to many and now a hero — one that puts a face, and especially a smile, to the Down Syndrome Society of Canada. He and nine others were chosen from hundreds of entries to be one of the society’s heroes. They are recognized as “strong community leaders who make a difference in the lives of people with Down Syndrome”, it continued. Andrew epitomizes the society’s definition of a hero. His mom beams with pride when speaking of her son and his accomplishments — especially his latest, hero status. In many ways though, Andrew is a typical young adult — he loves playing the drums, playing Rock Band, watching movies, hanging out with family and friends and heading south for a little vacation. “He is caring, thoughtful and has a spirit that I wish everyone in the world could see,” she said. Thanks to his ambitious aspirations — many have already had that pleasure. The Centers for Medicare & Medicaid Services, Center for Medicaid and CHIP Services is hosting a series of webinars to explain key components of the Medicaid Eligibility final rule. The webinar materials, including an audio recording and transcript, will be available after the event. Though March might symbolize Irish luck along with the official transition from the winter months to spring beginnings, another event will give additional meaning to the month as World Down Syndrome Day has now been officially recognized by the United Nations. 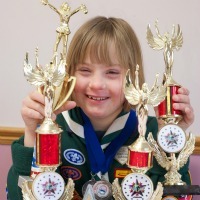 Allendale resident Diana Stolfo was chosen to represent the National Down Syndrome Society at the UN's March 21 conference recognizing it as World Down Syndrome Day. Above, Stolfo works at her job at the Gap in Ridgewood. The UN held a conference at its headquarters in New York City on March 21 to celebrate the event and there representing the National Down Syndrome Society (NDSS), which collaborated with other organizations for the event, was self-advocate Diana Stolfo, a current Allendale Orchard Commons resident. The UN officially recognized the day after Down Syndrome International (DSI) and countries around the world had partitioned the organization to name March 21 after Down syndrome, which is a life-long genetic condition in which varying degree of learning and/or physical disabilities may be present. Stolfo said she likes being an inspiration to others and thinks it's important that people put aside notions that "we can't do anything. 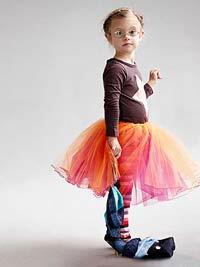 We can, we just have to do it differently," she said. The former Ridgewood resident added that she enjoys things as much as other people and can work and live independently, but more importantly, she's never been hindered by her condition and continues to follow her dreams and make them become a reality. "NDSS is considered a sponsor and we wanted to have a wonderful self-advocate be at the event. We chose Diana. We wanted her to be front and center and to shine instead of just having someone from our organization," said Julie Cevallos, vice president of marketing for NDSS. She added that March 21 being recognized on an international level will help promote the condition and fight stereotypes associated with Down syndrome. The 501(c)(3) nonprofit's mission is to be the "national advocate for the value, acceptance and inclusion of people with Down syndrome," Cevallos said, and this world recognition fits with NDSS' envisioned world in which "all people with Down syndrome have the opportunity to enhance their quality of life, realize their life aspirations, and become valued members of welcoming communities," she said. Stolfo joined Cevallos Monday night on NBC New York's Nightly News with Chuck Scarborough to speak about World Down Syndrome Day. "It'll truly be an inspiring event," Cevallos said of yesterday's event. "I think it's important that it's recognized globally as every country is in a different point of acceptance. Some have been very instrumental in having more inclusion in schools and society. But it's important not just as a country but as a world to accept and include people with Down syndrome and other special needs." Serving as an inspiration Cevallos said Stolfo "exemplifies everything we want the day to stand for, including having people integrate in society, schools and community life" and that Stolfo serves as a role model to many. 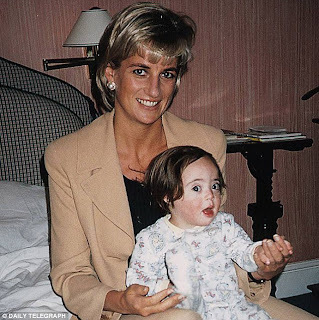 "Diana is a wonderful example for people worldwide of what you can do when you are included and accepted," Cevallos added. On a local level, Stolfo has served as an inspiration to others and made strides to bring attention and awareness to people with special needs, whether it's advocating for greater access to transportation or promoting additional special needs housing. Stolfo said she enjoys speaking engagements and wants to educate and inspire people to learn more about Down syndrome. To date she's participated in 12 speaking engagements since 2010 and Wednesday's event was her 13th public speaking event, which does not include interviews on news networks. In October 2010, when Allendale opened its first special needs housing called Orchard Commons, Stolfo sought to be among the 30 adults that would be given the opportunity to live there independently. Since that time, she's worked with United Way, which supports expanding housing for special needs, doing speaking engagements and advocating for greater access to transportation in Allendale and bringing awareness to the need of transportation access for those with special needs at a Bergen County Freeholder public hearing. She said developing more housing for people with special needs is important and she's talked with United Way three times between July and November and also spoke at the Governor's convention on housing and economic development. She also addressed the ARC & Cape Resource Center for Bergen County Special Services. She's been the Grand Marshall for the Down Syndrome Buddy Walk of Bergen County and spoken at the Ridgewood Access for All weekend testimonial. In 2011, Stolfo spoke at the National Down Syndrome Society Gala at the award presentation in February, and spent several days in May and June speaking at the DD Connect Housing Panel, Bergen County Freeholders on transportation, NJ TIPS, NJ Transit in Trenton on access for transportation for those with special needs. Stolfo said she shares and celebrates her life and accomplishments in order to inspire others. "We've been very blessed," said Stolfo's mother, Joanne. "Diana has been able to accomplish so much and she lives in a great community. She attended ECLC as a senior and was in the Ridgewood School system before that, which also gave her a great education." While Stolfo attended school in Ridgewood, she participated in DECA, was on the honor roll and joined the student council. But becoming a self-advocate started when she was thinking of running for president of the student council, she said. "I said, 'I'm not going to run for president, I'm going to run for special needs,' and I did," Stolfo said. She became the representative for those with special needs on the student council. After she started school at ECLC of New Jersey in Ho-Ho-Kus for her senior year of high school, Stolfo became the student council president and was also the newsletter editor. "Diana's so inspiring, especially to other people who may have other challenges or for parents who might not know what to expect," said Cevellos, who added that Stolfo will be receiving an award at a later NDSS luncheon for her involvement. World Down Syndrome Day had previously been established in 2006 by DSI, with the goal of "raising awareness and mobilizing support and recognition of the dignity, rights and well-being of people with Down syndrome across the world," according to its website. 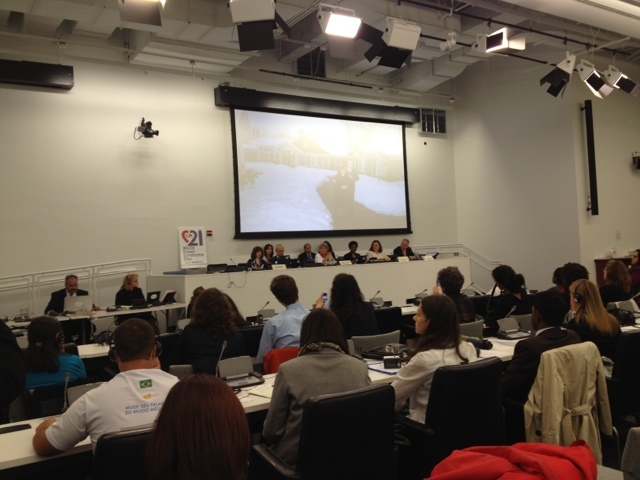 The UN's event, "Building our Future," featured speakers from the sponsored organizations, the Missions of Brazil and Poland to the UN, as well as other collaborators around the world. The day included information about the significance of having it on March 21, as Cevallos said it is the 21st day of the third month of the year - a symbol of the third copy of chromosome 21 present in Trisomy 21, the most common form of Down syndrome. Statistics indicated that one in every 691 babies in the United States is born with Down syndrome, and more than 400,000 people affected by Down syndrome in the United States and an estimated 7 million people in the world and people with the condition have an increased risk for congenital heart defects, thyroid conditions, Alzheimer's disease, childhood leukemia and respiratory and hearing problems. 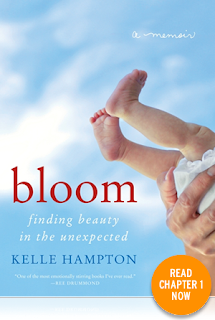 Cevallos said that the day is not just focused on what makes those living with Down syndrome different, but the emphasis is on celebrating who they are as people in addition to educating the world about the condition and offering stories of inspiration. "Public awareness to promote the value and inclusion and acceptance of people with Down syndrome," Cevallos said. "I think we're making great strides but not consistent in the world and country, the more we can share the more we can all learn." She added that "people don't always understand or know what to expect or no anyone with Down syndrome, education and awareness is one thing, schools are tough, teachers are expected to provide education on an individual basis yet include everyone as part of the larger group, so it's not easy. It takes time to meet the needs of all children." NDSS' My Great Story collection can be found at ndss.org/stories for more examples of what it means to have Down syndrome in today's world. "We try to fight stereotypes and it's important that it has its own day," said Cevallos. "March 21 characterizes the condition. But they are people first. They are living with a condition that gives challenges, and it's across the board, the challenges are not the same and they range in degree." One stereotype of those with Down syndrome is that they cannot maintain a job or live independently. But Stolfo proves that's not always the case, while certain jobs may be better suited for people with specific types of special needs, it shouldn't be used as a disclaimer for all people with special needs, she said. She's proud to announce that she has four part-time jobs, one of which she's had for more than a decade. Stolfo said it's important that people recognize that Down syndrome is a condition, but it doesn't shape who she is. For her jobs, she currently works as a receptionist at Our Lady of Mt. Carmel church rectory in Ridgewood; is a clerical assistant at ECLC of New Jersey in Ho-Ho-Kus; is a dance assistant at Meaningful Movements in Midland Park; and works as a sales and stock associate at the Gap in Ridgewood. She's worked at the Gap for 12 years, she said, and previously worked in a supermarket, restaurant and in a real estate company in various positions. Stolfo's also had several internships, including working at Valley Hospital as a volunteer, a teacher's assistant at a summer special education program in Franklin Lakes and volunteering at the Ridgewood Chamber of Commerce. Another stereotype Stolfo said is not true is that people with special needs cannot have meaningful relationships. She said she enjoys living independently at Orchard Commons and has been dating her boyfriend for three years, who also has Down Syndrome and lives at Orchard Commons. "I also like Zumba and exercising, movies and dancing," she said. "We're just like everyone else - we can see, hear and speak. I want us to be heard by our voice and not anything else." Stolfo has also been involved with the Special Olympics as a gymnastic athlete and been awarded with the president's award for excellence, Rebecca S. McDonald Transition Award and the Eagle of the Cross Award for Roman Catholic Youth Group Leadership. She said she personally doesn't like the word "disability" because it implies "we're not able to do something - that we don't have the ability. What matters who is you are. I changed the word to 'differently-abled' because what matters is what's in our hearts." Scott McCall is no stranger to the water. The 30-year-old grew up in Huntington Beach. He learned to swim at Pacific Sands Cabana Club with his sisters, Jayme and Megan. But McCall always wanted to surf. He received special lessons at the Surf's Up for Down Syndrome event Friday. McCall was one of several potential surfers with Down syndrome learning from pros and experts near the Huntington Beach Pier. Former Angels announcer Rex Hudler's Team Up for Down Syndrome, in conjunction with the International Surfing Museum, put on the inaugural event, which also featured live and silent auctions, as well as a banquet at Sandy's Beach Grill. The sun glistening off the waves wasn't the only radiant scene Friday afternoon. There were smiles galore and laughter from amazement, as adults and adolescents with special needs rode waves. McCall's father, John, said his son had tried surfing before, but had not been able to stand up. McCall stood up for a bit and caught some waves Friday, said Danny Nichols, his teacher. "Scott killed it," Nichols said of McCall's sessions. "He did a great job. We paddled into a few waves. He stood up and had good balance. Out of eight or nine waves, he stood on five of them." Nichols, a former pro who lives in Huntington Beach and owns a silk-screen T-shirt business, found out about the event from Brett Barnes, the owner of Duke's Huntington Beach. Nichols said he was honored to help out and gained joy from working with people with Down syndrome. John McCall said he was excited for his son. "I want to get him on the board so we can surf together," he said. Hudler, a former Major League Baseball player who went on to become the Angels' color man, called the surfing portion of the event the highlight of the day. Hudler and his wife, Jennifer, have four children. Their 15-year-old, Cade, was born with Down syndrome. They watched Cade learn and try to surf with all his friends. "I've been emotional the whole day to see the fun they had out here," Rex Hudler said, standing by the shore. "The typical kids showing them and how much fun they were having was also great. And to see that, given a chance, kids with Down syndrome can do anything. That's why I call it 'up syndrome.' It's not Down syndrome." Angela Armenta & Antoinette Mendoza are two friends who have Down Syndrome, but they are not letting that stop them from completing the LA Marathon March 18th! These two determined ladies are part of Team ARC, an organization that helps individuals with developmental disabilities and an official charity of the LA Marathon. 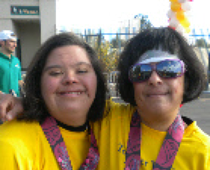 According to ARC, Angela & Antoinette will be the first women with Down Syndrome to complete the LA Marathon, and they are beyond excited to hold that title! Their inspiration came about when they saw their friends Rafael & Tim, two men with special needs, complete five marathons over the last few years. Angela will embark on this journey with her friends by her side, along with her brother Joe and sister Rebecca, encouraging her to complete the 26.2 mile journey. Since the beginning of her training, her family says that Angela’s heath has improved and that through this rigorous process, her personality has come alive, her speech has improved and she is actively using new vocabulary words she has learned while training. Despite being diagnosed with a hole in her heart at age 5, with medical clearance from her doctor, Angela is determined to succeed and ready for this challenge! Antoinette’s dream is to finish the marathon alongside her two friends, Rafael & Tim. Already an avid 5k participant, she is very proud of the medals she currently has and cannot wait to add the LA Marathon medal to the collection. Antoinette beams when she tells people about the race “I can do it, run all the way from Dodger stadium to the ocean, I try my best, 26.2 miles, I love it!” Antoinette will be running with Rafael, Tim, an ARC staff member who has volunteered to assist them and a Physical Therapy student from USC. As these two inspirational ladies make history, Team ARC hopes to bring awareness to the developmentally disabled community and the importance of health & friendships, while giving hope to parents of children with special needs. As a mother, you always worry about how your children will cope when you are not there, but you can reconcile yourself to the idea that they will be fine, and independence will be the making of them. Every September, there appears a flurry of agonised articles by mothers wondering how they will cope with empty-nest syndrome as their children leave home for university. As a mother of a child with a learning disability, I would give anything to have that problem, and I read these articles through tears of rage. For every parent of a disabled child, the thought of that child becoming an adult is terrifying and all-pervasive. I know that in some sense Domenica is never going to grow up, even if the law, once she turns 18, will regard her as an adult like any other. Domenica, despite her encyclopaedic knowledge of teenage programmes on the Disney channel, cannot tell the time. She is unable to tie her shoelaces or her dressing-gown cord. She cannot put her hair in a ponytail or go out on her own. And none of this will magically change when she becomes an adult in the eyes of the law. This turning point is a huge problem for those with a learning disability. There is no allowance for the fact that a disabled child will become a disabled adult, seemingly no understanding that a lifelong learning disability is exactly that – lifelong. Overnight, vulnerable children are thrown into the lion’s den of adult services, often with disastrous results. There needs to be a recognition that a learning disability does not change from childhood to adulthood. Perhaps part of the problem is the replacement of the word ‘handicapped’ with ‘learning disability’. The impression created is that we are dealing with people who are just a little bit slow.In general, when people talk about disability, they mean a physical disability. In those cases, the person with the disability is as self-aware as anyone is, but when you are dealing with a mental disability the issues are much more fraught. I find it very difficult to explain to Domenica why the people she was at school with have moved on, and all seem to be doing things she is unable to do. The looming question, that colours every decision I make, is: what will happen to Domenica when we are no longer around to look after her? She fears independence because she is self-aware enough to know that it will be very difficult for her. I wanted to meet other parents on the same journey, and this became the subject of the BBC documentary Letting Go, to be shown this week.While making the film, I met a mother whose life expectancy was limited, and who had to make the terribly painful decision to move her teenage son out of her home so that he would have time to adapt to living somewhere else before she died. I am in touch with one mother who is in her late 80s, and her disabled son, who is now in his 50s, has always lived at home. He is not capable of living anywhere else and she is confronted with her own mortality. It is far too late for him to adapt to living elsewhere. Domenica has always been in mainstream education. A school for pupils with mild learning difficulties would perhaps have been better – madness, a child like Domenica sitting in a chemistry class – but, within our county, they have all been closed. She has now been lucky enough to get a place at Chickenshed, an inclusive theatre company and performing arts day school in North London. She is doing a BTEC extended diploma in performing arts, a sixth-form course. She is happy there, but is now convinced that she could have a career on the stage, and be a pop star and a supermodel. She sees no reason at all why this should not be possible. I realise many children of The X Factor generation have these delusions, but it is particularly pronounced in a child like Domenica. I don’t in any way want to limit her horizons, but I feel that I must manage her expectations. I have to make sure Domenica has certain skills that will perhaps, in the future, enable her to get out to work, and be part of a community. She has already done a week-long waitressing course at Chalk Farm Hotel near Eastbourne, which employs and trains only people with learning disabilities, and I will encourage her to do more in that vein. It is very important for all people with learning disabilities that they become as independent as possible, and don’t stagnate in some form of institutional care, staring slack-jawed at a television screen all day long. It is vital to have the sense of self-esteem that comes with doing some honest work, if they are at all capable of it.Where these young adults live is an overwhelming problem for parents. The disability lobby in this country has been driven by those with physical difficulties, while those with a learning disability have been dragged along in their wake. While it is absolutely right that people with physical disabilities should be living independent lives, it is not necessarily appropriate or even possible for those who are more vulnerable and trusting. There is an ideology that says that everyone is the same, and has the same right to live independently. This is putting people with learning disabilities into inappropriate accommodation, often with only two hours of care a day, and in flats on their own. The sense of isolation that they feel, but cannot express, is heartbreaking to witness. What sort of society thinks this could be a suitable way to live? What sort of society allows the social worker, without the parent present, to interview the ‘client’, and after half an hour decide a flat in the community is an appropriate setting? Some inspirational parents I know, unable to find somewhere suitable for their daughter, rented a house in Hove, where she now lives with four friends. There is always someone there at night, and the number of carers in the day depends on what they are doing. The atmosphere in the house is that of any group of young people living together. There has been such a demand for places that they have now opened two other houses. They have constant battles with the local authority, which would prefer for these young people to be living in single-occupancy flats. One mother told me that her daughter, who has Down’s Syndrome, was moved into a flat on her own. After six months, she had put on five stone. Her mother spoke to the social worker, who replied that ‘It was your daughter’s choice’ to eat all day long, and cited the Human Rights Act. This young woman is not capable of making such a choice, and needs support and guidance, not another packet of crisps. Another mother wrote to tell me that an Adult Services Reviewing Officer had written to her daughter, asking her to think about her ‘goals for the year’, and what she was ‘hoping to achieve’. Her daughter cannot walk, talk or feed herself, and has no mental capacity. We have a system in place in our country that is supposed to support the most vulnerable, but it is failing. It has become so complex and unintelligible that it is not helping those who need it most. I accept a system that hopes to deal with disability from cradle to grave cannot have clear-cut simplicity, but over the years there appears to have been little joined-up thinking, and I suspect even the professionals have lost their ability to make good decisions. One vast improvement would be to have a single assessment of the needs of families, rather than the endless to-ings and fro-ings between various departments that currently makes the system both intimidating to the user and far too time-consuming. In opposition, David Cameron, who himself was the father of a severely disabled child, told me that this would be his preference, but nothing has changed. I have had dealings with Government: I have sat on various committees, had meetings with Ministers, and even one with the Prime Minister, but there seems to be a bureaucratic inertia that is holding the Government back from making the necessary changes. In 2010, George Osborne announced an extra £2 billion a year for social care by 2014 in his Comprehensive Spending Review, but this money – supplied by the taxpayer and granted to local authorities – is not ring-fenced. Local authorities are not legally obliged to spend the money on what it was intended for, resulting in a postcode lottery for parents. The Government defends this on the grounds of ‘localism’, and says it is up to the local authority to decide whether to use it for the purpose it was given. As a result, I know of several parents who have had to move away from their families and friends in order to secure better provision. All I want for Domenica is for people to accept her as I do, to recognise the contribution she can make, and to keep her safe. All my maternal instincts scream at me to keep her with me at home for ever. But then what happens when we die? But some are more different, and more vulnerable than others. This is a list of recent articles with brief summaries on this topic. The parents of a four-year-old Oregon girl with Down syndrome are suing Legacy Health in Portland because they say doctors misdiagnosed their daughter as not having the condition during a prenatal screening. As a result of doctors’ reassurances, according to KATU, the parents decided to continue the pregnancy. They are suing for $7 million, an amount they say will pay for the girl’s care for life. Court documents were not immediately available, so it’s unclear what type of genetic testing the couple underwent. Genetic counselors say there are different types of screening options, including amniocentesis, chorionic villus sampling, and an ultrasound combined with blood testing. A blood test with an ultrasound will only predict the risk of developing Down syndrome or other genetic abnormalities, said Virginia Carver, a prenatal genetic counselor at the University of Miami’s Miller School of Medicine. Amniocentesis will determine whether or not a child has Down syndrome and is considered the “gold standard” of testing, Carver said. That test is typically about 99 percent accurate. Neither the hospital nor the couple would comment on the case, which is now being heard in a Multnomah County court. A Portland, Ore. couple was awarded $2.9 million on Friday for the care of their Down syndrome baby, who they argue would not have been born if doctors had not been "negligent” in their pre-natal care. Ariel and Deborah Levy won their "wrongful birth" suit against Legacy Health System, arguing they chose to continue their pregnancy based on what doctors told them, according to ABC News, and would have terminated it if they had not been assured their baby did not have the genetic condition. Jurors found five instances of Legacy Health's negligence, including a doctor's finding that the baby had a normal chromosomal profile based on a test that was performed and analyzed incorrectly. My main point is, Mr. and Mrs. Levy, your daughter is ALREADY HERE. And she’s NOT STUPID. If she doesn’t already sense it by the resentment made clear by your suit requesting damages for the strain she has placed on your relationship, someday she will most certainly hear about it through other means and her heart will break. I can think of only a handful of things worse than the pain of a child learning that her parents would have preferred she not exist because of the way she is. Hey. I’m no hypocrite. I’ve talked openly about the early days of Andrew’s autism and epilepsy diagnoses; I’ve talked about having to grieve the child I thought I would have in order to accept the little angel I was given. But even on my worst days as a mom (and there are plenty, folks) I could never imagine not choosing him over a potentially easier version. In fact, I would choose him every single time. Does that make me better than you Mr. and Mrs. Levy? No. I don’t think so. I may judge your decision to file this suit and the way you have chosen to publicly go on record and claim that your daughter should have never been born (your lawyer can spin it anyway he wants to but if it looks like a duck, swims like a duck and quacks like a duck, it’s probably a stupid freaking duck), but I do not claim to have ever walked a day in your shoes as Kalanit’s mom and dad. We take a lot of tests during pregnancy to ensure that our babies are healthy. Sometimes, a positive outcome on certain tests, like the one for Down Syndrome, might cause some couples to abort the baby rather than face a life of disability. An Oregon couple said they would have done just that had they’d known that their daughter would be born with Down Syndrome. But after being assured by their doctor that the baby was free of the genetic disease, they went on with the pregnancy, and their daughter was born with Down Syndrome 4 years ago. After suing Legacy Health System, Ariel and Deborah Levy were recently awarded $2.9 million in a “wrongful birth” suit. The couple says they clearly would never have had this child if they knew, and now they will use the money to help care for their daughter’s special needs. This type of case going to trial is rare, partly because of the repercussions of parents testifying that they would have aborted their child if they had known (and you can just imagine the long-term mental damage that testimony might do to a child as he/she grows up). The case could have far-reaching - and questionable - implications for children born with with conditions such as Down's. There are fewer than 10 'wrongful birth' cases in the U.S. every year as prenatal tests are 99.7 per cent accurate - and few parents want to face a legal challenge if they do fail, the Oregonian reported. Yet experts believe there could be a boom in the lawsuits as women in their late 30s and 40s are increasingly having babies and relying on genetic screenings to signal problems, the paper added. Civil engineer Ariel and dental hygienist Deborah, who say they love Kalanit and intend to give her the same opportunities they have given their sons, were stunned when hospital staff told them she appeared to have Down's. After their daughter was born with the syndrome, the Levys expressed their fears over her future, including medical and social issues, and whether she would get the required educational support. Experts have told them she will probably not be able to live on her own or support herself, the Oregonian reported. It is estimated she will live until her mid-50s. She is able to speak in two-word sentences which only her parents and a few others understand, according to the Oregonian. Yet the Levys say Karen Gaffney, who has Down syndrome and earned a Portland Community College degree, is a role model for their child. What is not right, however, is the backlash. The couple is receiving death threats! What is up with internet people out for blood lately? Is the economy stressing people to the max so they take out their frustrations on people they don't even know? You can disagree with someone's decision without calling for their demise. The big go-to insult for me in recent weeks has been to call child protective services on me. "Call DCFS!" is the new, "yo mama so fat!" My big crimes were not wanting guns in the house (creating an unsafe environment, according to one vocal gun nut) and not scrutinizing Nick Jr.'s motives in retiring a cartoon moose. Yes, my children suffer terribly from both of those things. Conclusion: I don't agree with the lawsuit, but these people are just handling their business and don't deserve harassment. "Not doing harm is of great importance to most clinicians, because that's why they have gone into the profession," she said. "The reading of some of these tests can be complex." And so are the moral questions surrounding this type of decision, she said: "We understand much more about early education for these children and how to help them in the world." The Northwest Down Syndrome Association said regardless of parents' final decisions, they usually deserve more information than they're getting now. "What life is like for having a child with Down syndrome at the same time there's a huge increase in testing but no huge increase in good information on what life can be like," said Angela Jarvis-Holland. "My clients had two children, this was a surprise pregnancy and they were doing like any responsible couple would do - trying to find out what the status of this pregnancy was," said their attorney, David Miller. Because of markers indicating a risk of Down syndrome, "she repeatedly called the clinic and said 'Do I need to be concerned about this?' And was repeatedly advised no you don't because the CVS (Down syndrome) test was normal." After the verdict, Legacy released this statement: "While Legacy Health has great respect for the judicial process, we are disappointed in today's verdict. The legal team from Legacy Health will be reviewing the record and considering available options. Given this, we believe that further comment at this point would not be appropriate." The Levys are not alone in saying that they would not have had Kalanit. Studies show that more than 85 percent of parents who learn through prenatal testing that a fetus has Down terminate the pregnancy. Wrongful birth lawsuits are rare. The tests are highly accurate and mistakes are uncommon. If a test fails to detect a serious problem and the parents want to sue the lab, doctors or hospital, the parents have to go to court and argue in a public forum that they would not have had their child if they had known. They have to try and put a dollar value on the “harm” they feel they have suffered. These are claims that very few parents are willing to make in the privacy of their own home, much less a courtroom. Moreover, those bringing wrongful birth lawsuits have to do so knowing that their family and friends are watching and judging them. They risk leaving their other children (the Levys have two sons) wondering if their parents really wanted them. Wrongful birth lawsuits are a horrible way to deal with failed prenatal testing. Forcing parents to argue that their child never should have been born may make legal sense but it is morally absurd. Why ask parents to reject the existence of their own child? Who can really put a value on a life that some argue in court ought not exist? There is no reason to permit wrongful birth or wrongful life cases. When a mistake is alleged about genetic testing there ought to be some sort of no-fault insurance scheme under the supervision of neutral mediators, not a courtroom slugfest that demeans the value of a life with disability and reeks of eugenics. Miller, the Levy's attorney, contends that Dr. Thomas Jenkins removed maternal tissue -- not fetal tissue --from Deborah Levy's womb. The suit faults Jenkins and lab workers for not recognizing that the tissue was from the mother. The suit also faults Legacy for reassuring her that her baby didn't have an extra 21st chromosome even though two ultrasounds allegedly raised red flags by showing traits of Down syndrome. Legacy's attorney said Jenkins and other staff followed proper procedures and weren't at fault. Attorney Robert Keating said the CVS found only normal cells because Kalanit has mosiac Down syndrome -- meaning a significant number of her cells don't contain an extra 21st chromosome. Keating pointed to an analysis of Kalanit's cells -- taken after birth -- that showed nearly 31 percent are normal. But the Levys' attorney told jurors they should discredit that analysis because it had been done by a Legacy lab looking to defend its legal position. Miller argued that 100 percent of the cells analyzed in the CVS were normal because they were Deborah Levy's cells. Meanwhile, other samples of tissue taken from Kalanit after she was born show an insignificant number of normal cells, less than one or two percent. Robert Keating, Legacy’s attorney, contends that the test results were accurate because Kalanit has a mosaic form of Down Syndrome where a significant number of her cells do not contain the chromosomal abnormality. There should be no such thing as a “wrongful life” or “wrongful birth.” But lawsuits are filed from time-to-time seeking damages because a baby was born that the parents would have destroyed in the womb “had they only known.” For example, a few months ago we discussed one such case in Israel. These cases are different than a legal malpractice suit in which the actions or inactions of the doctor caused the illness or disability. Rather, the claim is that the child would have been aborted if the parents had been properly told about the nature of the baby that they received. “We love her totally but would have killed her before she was born?” I hope never learns that her parents brought this case. And I hope the jury rejects it out of hand. Doctors are not guarantors of outcomes. We don’t–or at least shouldn’t–have a right to the baby we want. Most importantly, none of us should ever be declared in law to have been wrongfully born.